The amount of data being collected, stored and analyzed is increasing at an unprecedented rate. Cloud technology is uniquely positioned to help law enforcement solve this challenge. Last week, AWS ninjas, cloud experts, and partners traveled to San Diego for the 123rd annual International Association of Chiefs of Police conference held in San Diego, CA. The International Association of Chiefs of Police (IACP) is a worldwide organization for law enforcement leadership to communicate new ideas, share experiences, disseminate new information, and build relationships with other law enforcement entities. The conference included sessions on trends in the law enforcement environment, new ideas, technology applications, real-world scenarios, policy discussions, vendor presentations and topics of interest (such as recent police involved shootings, the rise of drug-related crimes, and migrations/transitions to new crime reporting mechanisms). Law enforcement has been faced with many significant challenges over the past year, and IACP recognizes the sacrifices that officers make every day. Through technologies like body cameras and policies and portals used to share datasets with the public, law enforcement agencies have the opportunity to collaborate with their communities and build trust. Every session at IACP included references to the massive amounts of data that law enforcement agencies are collecting and will need to store moving forward. Agencies understand that they are going to need new technologies to manage the increasing volume of data and that there is so much that can be done with their data to enable smarter policing, increase transparency, and strengthen community relationships. Our partners like Motorola, Socrata, BodyWorn and Mark 43 provide public safety solutions that will help law enforcement transition to 21st century policing and ultimately increase transparency and strengthen community relationships. These powerful tools assist police by using analytics to derive critical insights, reduce crime, deploy resources more effectively, and arm officers with information they need to protect their citizens. Watch the IACPtv video below that was shown at the conference to learn about technology’s role in transforming the future of policing. Continue to learn about the next generation technology that is ushering in a new era of policing here. 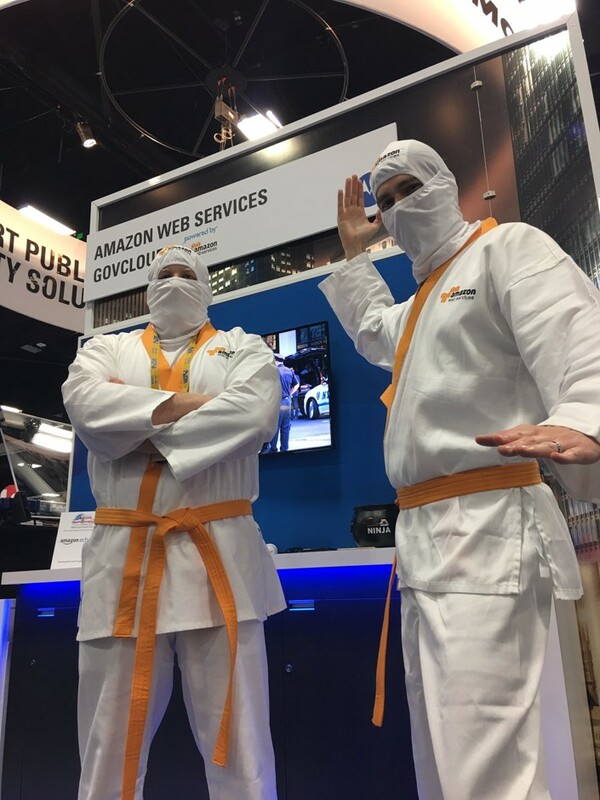 And check out some of the photos of the AWS ninjas sharing cloud computing tips at IACP at @AWS_Gov.